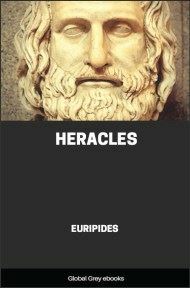 Heracles is an Athenian tragedy by Euripides that was first performed c. 416 BCE. 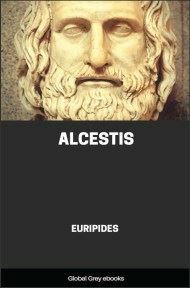 While Heracles is in the underworld obtaining Cerberus for one of his labours, his father Amphitryon, wife Megara, and children are sentenced to death in Thebes by Lycus. 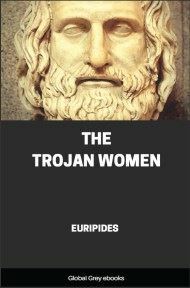 Heracles arrives in time to save them, though the goddesses Iris and Madness (personified) cause him to kill his wife and children in a frenzy. 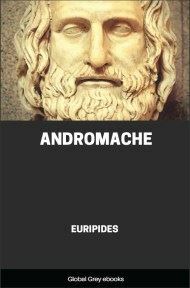 AMPHITRYON: WHAT mortal hath not heard of him who shared a wife with Zeus, Amphitryon of Argos, whom on a day Alcaeus, son of Perseus begat, Amphitryon the father of Heracles? He it was dwelt here in Thebes, where from the sowing of the dragon's teeth grew up a crop of earth-born giants; for of these Ares saved a scanty band, and their children's children people the city of Cadmus. Hence sprung Creon, son of Menoeceus, king of this land; and Creon became the father of this lady Megara, whom once all Cadmus' race escorted with the glad music of lutes at her wedding, in the day that Heracles, illustrious chief, led her to my halls. Now he, my son, left Thebes where I was settled, left his wife Megara and her kin, eager to make his home in Argolis, in that walled town which the Cyclopes built, whence I am exiled for the slaying of Electryon; so he, wishing to lighten my affliction and to find a home in his own land, did offer Eurystheus a mighty price for my recall, even to free the world of savage monsters, whether it was that Hera goaded him to submit to this, or that fate was leagued against him. Divers are the toils he hath accomplished, and last of all hath he passed through the mouth of Taenarus into the halls of Hades to drag to the light that hound with bodies three, and thence is he never returned. Now there is an ancient legend amongst the race of Cadmus, that one Lycus in days gone by was husband to Dirce being king of this city with its seven towers, before that Amphion and Zethus, sons of Zeus, lords of the milk-white steeds, became rulers in the land. 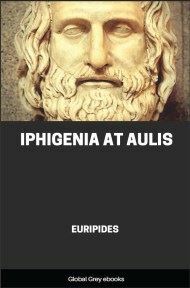 His son, called by the same name as his father, albeit no Theban but a stranger from Euboea, slew Creon, and after that seized the government, having fallen on this city when weakened by dissension. 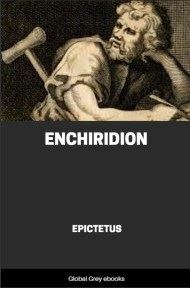 So this connection with Creon is likely to prove to us a serious evil; for now that my son is in the bowels of the earth, this illustrious monarch Lycus is bent on extirpating the children of Heracles, to quench one bloody feud with another, likewise his wife and me, if useless age like mine is to rank amongst men, that the boys may never grow up to exact a blood-penalty of their uncle's family. So I, left here by my son, whilst he is gone into the pitchy darkness of the earth, to tend and guard his children in his house, am taking my place with their mother, that the race of Heracles may not perish, here at the altar of Zeus the Saviour, which my own gallant child set up to commemorate his glorious victory over the Minyae. And here we are careful to keep our station, though in need of everything, of food, of drink, and raiment, huddled together on the hard bare ground; for we are barred out from our house and sit here for want of any other safety. As for friends, some I see are insincere; while others, who are staunch, have no power to help us further. This is what misfortune means to man; God grant it may never fall to the lot of any who bears the least goodwill to me, to apply this never-failing test of friendship! MEGARA: Old warrior, who erst did raze the citadel of the Taphians leading on the troops of Thebes to glory, how uncertain are God's dealings with man! For I, as far as concerned my sire was never an outcast of fortune, for he was once accounted a man of might by reason of his wealth, possessed as he was of royal power, for which long spears are launched at the lives of the fortunate through love of it; children too he had; and me did he betroth to thy son, matching me in glorious marriage with Heracles. Whereas now all that is dead and gone from us; and I and thou, old friend, art doomed to die, and these children of Heracles, whom I am guarding 'neath my wing as a bird keepeth her tender chicks under her. And they the while in turn keep asking me, "Mother, whither is our father gone from the land? what is he about? when will he return?" Thus they inquire for their father, in childish perplexity; while I put them off with excuses, inventing stories; but still I wonder if 'tis he whenever a door creaks on its hinges, and up they all start, thinking to embrace their father's knees. What hope or way of salvation art thou now devising, old friend? for to thee I look. We can never steal beyond the boundaries of the land unseen, for there is too strict a watch set on us at every outlet, nor have we any longer hopes of safety in our friends. Whatever thy scheme is, declare it, lest our death be made ready, while we are only prolonging the time, powerless to escape. AMPHITRYON: 'Tis by no means easy, my daughter, to give one's earnest advice on such matters easily, without weary thought. MEGARA: Dost need a further taste of grief, or cling so fast to life? AMPHITRYON: Yes, I love this life, and cling to its hopes. MEGARA: So do I; but it boots not to expect the unexpected, old friend. AMPHITRYON: In these delays is left the only cure for our evils. MEGARA: 'Tis the pain of that interval I feel so. AMPHITRYON: Daughter, there may yet be a happy escape from present troubles for me and thee; my son, thy husband, may yet arrive. So calm thyself, and wipe those tears from thy children's eyes, and soothe them with soft words, inventing a tale to delude them, piteous though such fraud be. Yea, for men's misfortunes ofttimes flag, and the stormy wind doth not always blow so strong, nor are the prosperous ever so; for all things change, making way for each other. The bravest man is he who relieth ever on his hopes, but despair is the mark of a coward. CHORUS: (chanting) To the sheltering roof, to the old man's couch, leaning on my staff have I set forth, chanting a plaintive dirge like some bird grown grey, I that am but a voice and nothing more, a fancy bred of the visions of sleep by night, palsied with age, yet meaning kindly. All hail! ye orphaned babes! all hail, old friend thou too, -unhappy mother, wailing for thy husband in the halls of Hades!